"It is a protest against failed demonetisation of Modi government where common people of the nation suffered its grave consequences," says the Congress. A day after the Congress launched a Twitter campaign against demonetisation on the second anniversary of the exercise, party workers have taken to the streets in protest. The dharnas are not only being held at the Capital but also across the country in Chennai, Chandigarh and Mumbai. "Indian Youth Congress is organising a protest outside RBI Headquarters on the occasion of the second anniversary of failed demonetisation. The protest is to highlight miseries of the nation since last two years under Modi regime. It is a protest against failed demonetisation of Modi government where common people of the nation suffered its grave consequences," the Congress said in a statement. Several Congress leaders, including former Rajasthan Chief Minister Ashok Gehlot, Anand Sharma, Sushmita Dev, Bhupinder Singh Hooda, Keshav Yadav and Manish Chatrarh were reportedly detained by the police for protesting outside the RBI headquarters. Yesterday, several Opposition leaders and activists took to Twitter to attack Prime Minister Narendra Modi-led BJP government for the note ban decision. Congress leader Shashi Tharoor tweeted about the "cost of demonetisation", adding that demonetisation cost the exchequer Rs 8,000 crore just for the printing of new notes while 1.5 million jobs and 100 lives were lost. 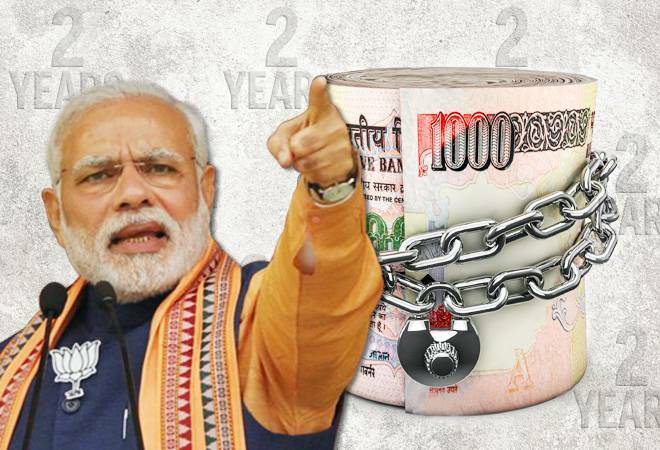 "Though the list of financial scams of Modi govt is endless, demonetisation was a self inflicted deep wound on Indian economy which even two years later remains a mystery why the country was pushed into such a disaster?" tweeted Delhi CM and Aam Aadmi Party (AAP) chief Arvind Kejriwal. "#DarkDay The government cheated our nation with this big #DeMonetisation scam. It ruined the economy and the lives of millions. People will punish those who did this (sic)," tweeted West Bengal Chief Minister Mamata Banerjee. The ruling party, meanwhile, has hit back with the hashtag #CorruptCongressFearDemo on Twitter. Stating that "confiscation of currency was not an objective" of demonetisation, Finance Minister Arun Jaitley said the decision to scrap currency notes of Rs 500 and Rs 1,000 two years ago had led to formalisation of the economy, curbing of cash transactions and more direct tax revenue. He added that the "prophets of doom" have been "conclusively proved wrong" with India retaining its position as the fastest growing economy for the fifth year in a row. 6. Informal economy meant exploitation of the poor and the marginalised, many of whom came from lower middle class. Demonetisation has led to formalisation of the economy, which has empowered them. Why is Congress opposing that? 7. Is the Congress party living in a state of denial that it cannot see the surge in GDP numbers, the 'Ease of Doing Business Rankings' and Global Competitiveness Index? Why are they unhappy that India's economic prowess is being recognised world over? 8. Why is it that whenever India's standing in the world increases, the Congress takes to defaming India and creating an atmosphere of gloom to mislead the people?